Chris Pratt and Jennifer Lawrence star in the science fiction movie "Passengers." Astronauts and other crewmembers on the International Space Station will get to watch the new science fiction movie "Passengers," while in orbit. Sony Pictures Entertainment announced today that it is working with NASA to send a digital version of the film to the orbiting laboratory. The movie centers on a massive spaceship carrying a group of humans on a 120-year-long journey to a distant planet, where they will make a new home. 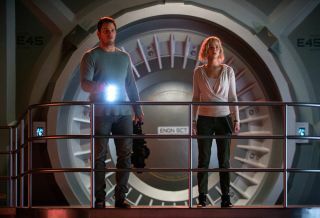 To survive the long trip, the passengers are placed in a hibernation state, but two people (Chris Pratt and Jennifer Lawrence) wake up 90 years too early and are forced to cope with their new fate. As part of the collaboration between Sony and NASA, Pratt and Lawrence recorded a short video discussing the real-world search for habitable exoplanets located elsewhere in the universe. Other movies that have been sent to the station in the past include "Gravity" (2013), "Star Trek Beyond" (2016) and "The Martian" (2015). Station crewmembers can enjoy movies and TV shows as a group using the onboard 65-inch (165 centimeters) projection screen, which was installed in April, 2015. This composite image shows the Screen Innovations' ISS Viewscreen deployed onboard the space station. NASA is participating in the film's release in other ways. Sony is hosting a panel discussion later this week featuring two scientists who will discuss some of the real-world science that the movie explores. The panelists are Tiffany Kataria, a NASA JPL scientist and expert on exoplanet exploration, and John Bradford, CEO of SpaceWorks, a company investigating human hibernation for spaceflight. "The movie is about the very real possibility of traveling to a new home around another star," Neal H. Moritz, a producer of "Passengers," said in the statement from Sony. "It's fascinating to discover the real science behind that — to see how astronomers are discovering exoplanets and finding ways that what we imagine could someday become a reality." In addition, NASA astronauts Garrett Reisman, Michael Massimino, and Nicole Stott will walk the red carpet at the movie's premier. "Passengers" will be in theaters everywhere on Dec. 21.